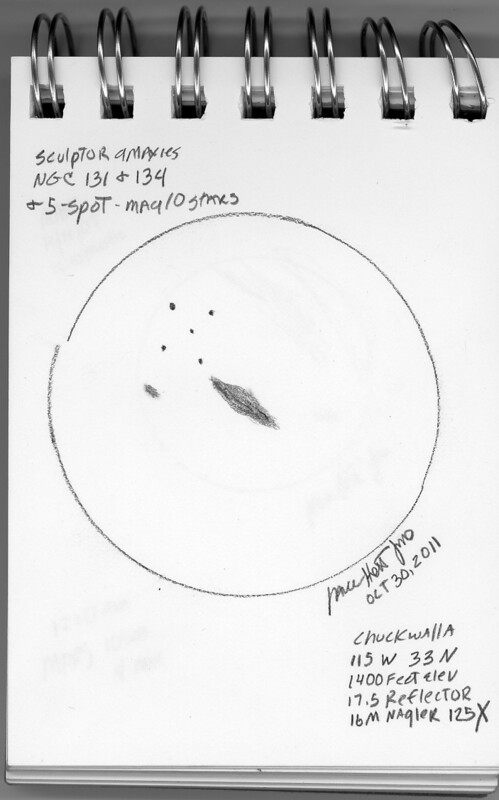 While Mojo and I were observing at Amboy Crater on October 22, 2011, Cliff, another observer at the site pointed out the constellation Grus, The Crane, low on the southern horizon. Grus isn’t a constellation I’ve paid attention to before – you need to be able to see down to the southern horizon in the fall, and you need to be observing at +34N Latitude or further south. If you can see well below Capricornus, Sagittarius and Sculptor in the autumn, give it a try! None of the star charts I brought on that occasion showed Grus, but I had just the startool at home for the following weekends (October 29) outing — the Herald-Bobroff Astroatlas! I hadn’t needed this lovely atlas since my 1999 Ayer’s Rock Australian observing trip with 20 other astronomers, and welcomed reacquainting myself with it. The atlas begins with the A Charts – wide swaths of the sky, showing several entire constellations. From there you are directed to the B Charts (image at your left), showing smaller segments of the sky and bright stars. The C Charts (9th mag stars and 14th mag. deep sky objects) are where I headed for this night’s observing, but in the past I have drilled down to the D (11th mag. stars and 15th mag deep sky objects), E and F charts for detail showing Coma and Virgo galaxy clusters and the Magellanic Clouds. There aren’t any bright galaxies to hunt for in the constellation Grus, and observing low to the horizon doesn’t afford the best views, either. But even so, I quickly observed the top ten or so – including some lovely galaxy clusters. 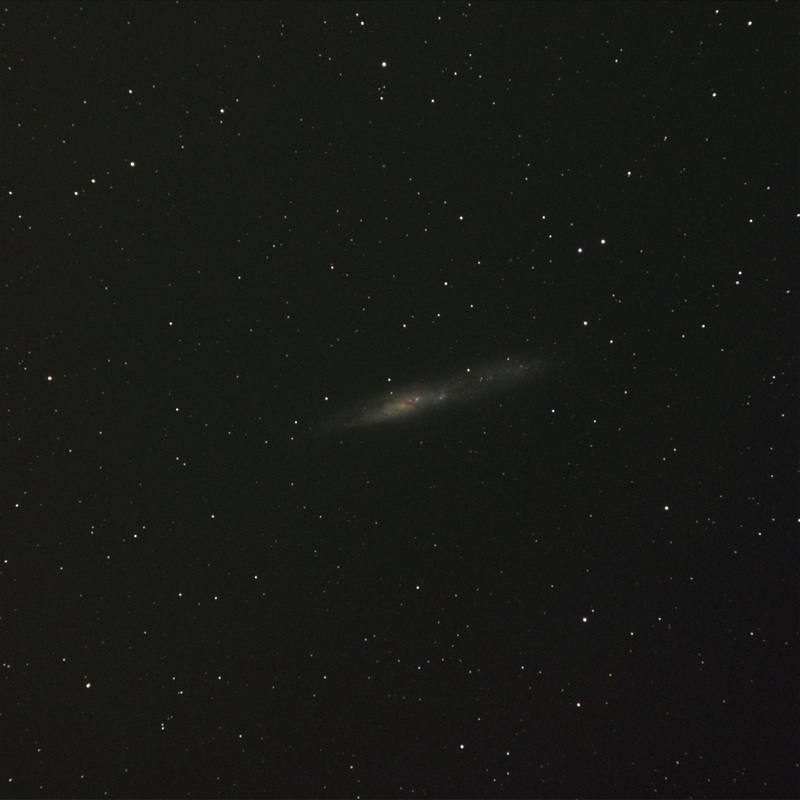 First I went for NGC7590 and 7599, a pretty pair of spiral galaxies discovered by John Herschel and Charles Dunlop. I didn’t see the distant Abell 1111 cluster, 2 billion light years away, just the two brighter galaxies. Next I hunted down a group of galaxies near NGC7418 – a face-on spiral galaxy nestled in a pretty string just below Fomalhaut on the Grus Sculptor border. Here’s a photo of the galaxies I observed. 7418 was discovered by Sir John Herschel at the Cape of Good Hope with an 18-inch f/13 speculum telescope in 1847. A supernova erupted in this galaxy in 1983. And Allan Sandage (1975, Astrophysical Journal, 202, 563-582) notes that this galaxy is a member of the IC1459 Grus Group. Well after midnight on this perfect observing night, our friend Dave came over and told me he had just observed some objects he had not logged before. “A pair of galaxies, with a little dice-shaped asterism of five stars next to it”. Soon I was on my own hunt for NGC131 and 134. It’s to the lower left of big open cluster Blanco 1 on the star chart. The smaller 131 was discovered by John Herschel in 1834, and the larger 134 was discovered in 1826 by James Dunlop in Australia. They are part of our local group of galaxies (LGG), and the galaxy group is also known as LGG-007 located 63 to 82 million lights years away. My sketch is to the left. This part of the sky is littered with easy to find galaxies, and I spent several hours hopping from one to another. 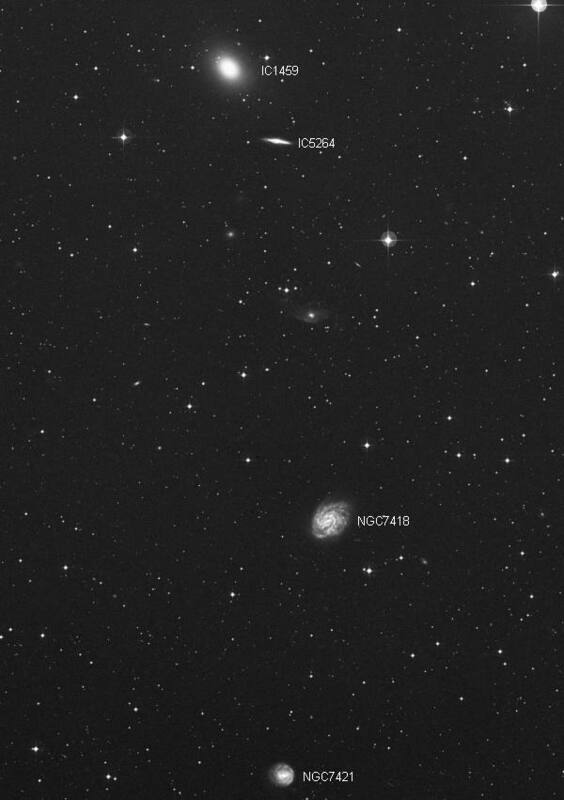 I was observing NGC55, an interesting barred irregular galaxy only 7 million light years away. It’s one of the closest galaxies to our own local group! I encouraged Mojo image it, even though it was low to the horizon. I love his image, and it looked a lot like this through the eyepiece, too. I made a rough sketch of the galaxy, and when I looked at Mojo’s image we both showed the pretty lineup of stars outlining the galaxy. This is just a sample of the dozens of galaxies I looked at in the deep southern sky on a late October evening. Fall offers long nights of darkness for galaxy starved amateur astronomers tired of all the bright milky way objects of summer. So ladies and gentleman, start your telescopes, and point as low as you can go. Aim your telescopes where the wings of the southern birds Grus and Phoenix fly. If you can’t go that low, Sculptor offers dozens of amazing objects to view. Open your atlas to the constellations around the South Galactic Pole near Sculptor, and you’ll enjoy hours of surfing the southern skies. Here are Mojo’s Astrophotos from October 29, 2011. I enjoyed visually observing these objects, and then seeing these postcards sent from the universe through Mojo’s astrophotography.